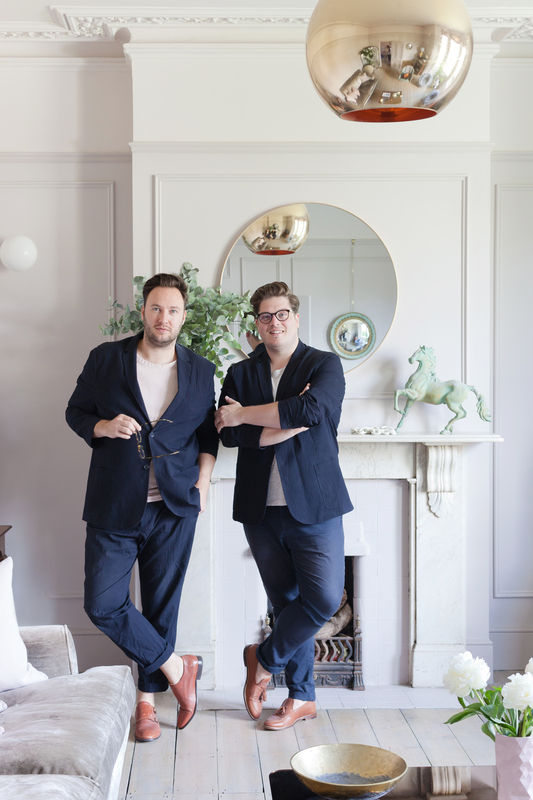 I first met Jordan and Russell from 2LG Studio on a M&S shoot for Red magazine, I remember how lovely they were (the name really does ring true in this case!) but also, how jealous I was of the room they styled…they just have that pure talent that can create something wonderful out of anything. So I was thrilled that they agreed to let me feature their amazing house in South East London on the site…get ready to be wowed. 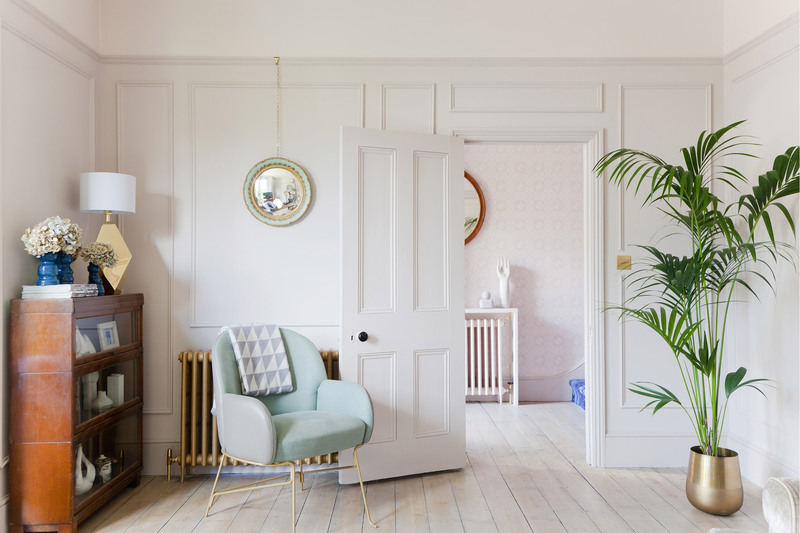 We are interior designers with a studio based in South East London. We set up our business about 5 years ago. We are passionate that you should live in your home for you and for the now. We invest a lot of time in travelling the world researching the design scene, so that we can bring the best of what’s on offer to each project. Design is a way of life for us. It’s everything. Whereabouts is your home? Did you completely renovate or was it in a decent condition to start with? It’s in Forest Hill, south-east London. We have been in for 2 years this January. We bought it as a wreck. It needed completely rewiring, re-plumbing, new windows throughout (still working on that one) and we had to repair the roof and rebuild the chimneys. When we moved in it was like an ice box because it was the middle of winter and the house had broken, single glazed windows, and no central heating. We lived for the first few months in thermals and ski gear. Not even joking. We used to sleep fully clothed in hats, with three duvets and a toilet trip in the middle of the night would mean a terrifying dash. But we slowly dealt with the issues and got it watertight and warm. It has been a labour of love for sure and there have been a lot of very difficult moments along the way. We are trying to embrace that and enjoy the process slowly. Because it’s something we love. Our clients seem to like the fact that we are going through it too. 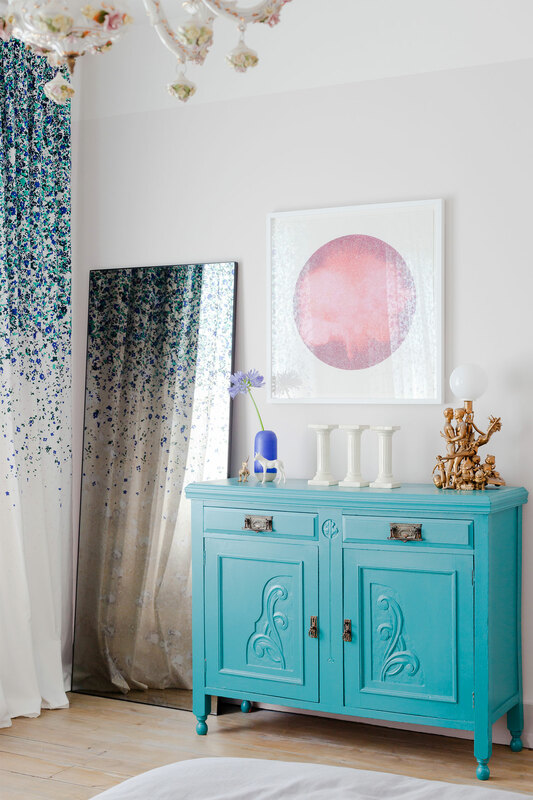 Where are your gorgeous radiators from? We did the rads in two phases because they are a big spend, but we wanted to save for special ones. The ones downstairs are from an online supplier called Trade Radiators and you can pick metallic finishes or bespoke colours but they take a little longer to arrive if you go for that (8-10 weeks) or you can get them white primed a little quicker and then paint them yourself in a colour of your choice. We wanted them professionally spray painted because they are an intricate shape and tricky to paint. 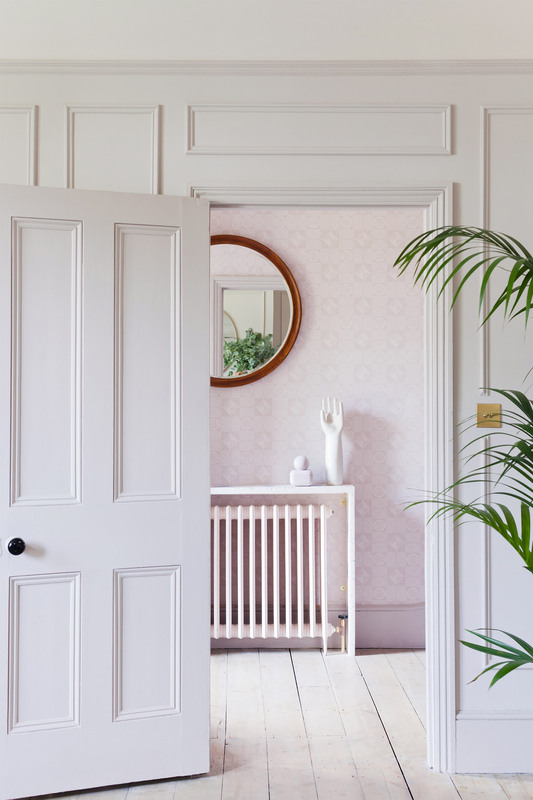 The radiators upstairs in our bedroom and hallway are from Bisque Radiators and we opted for their bespoke colour service, in this case they are painted to match all the woodwork in the house, Mylands ‘Rose Theatre’. I can imagine you’re quite hands on with your projects. Do you do any DIY yourselves or leave it to the experts? 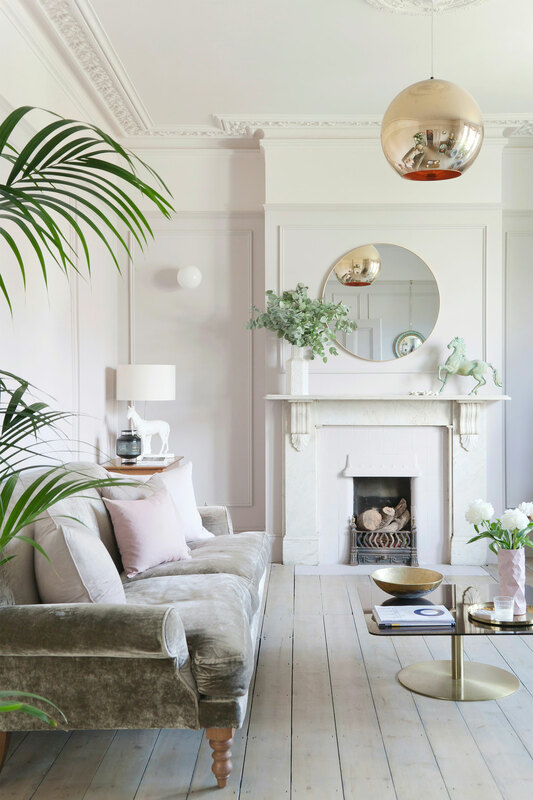 What are your favourite High Street brands for interiors? We love to mix a bit of High Street into our design projects and we are never snobby about where a piece comes from, as long as it does the job and looks gorgeous. H&M Home is always good for accessories (worth popping into store to see them though, as you sometimes find the scale of pieces varies wildly, and you can get yourself a cheeky new jumper while you are there, any excuse). IKEA will always have a place in our hearts (their Stockholm collection is so strong and their plants always find their way into our basket along with some tealights); we love a trolley dash in Homesense (great for lamps and mirrors and cushions); West Elm is a go-to for glam lighting and furniture; La Redoute is a surprise winner for a great selection of rugs, killer headboards and chairs; Liberty of London is always inspiring and you can often find us playing with combos in their amazing fabric room. Any up cycling projects in your house? We aren’t big on upcycling. We have one piece though, in our bedroom. 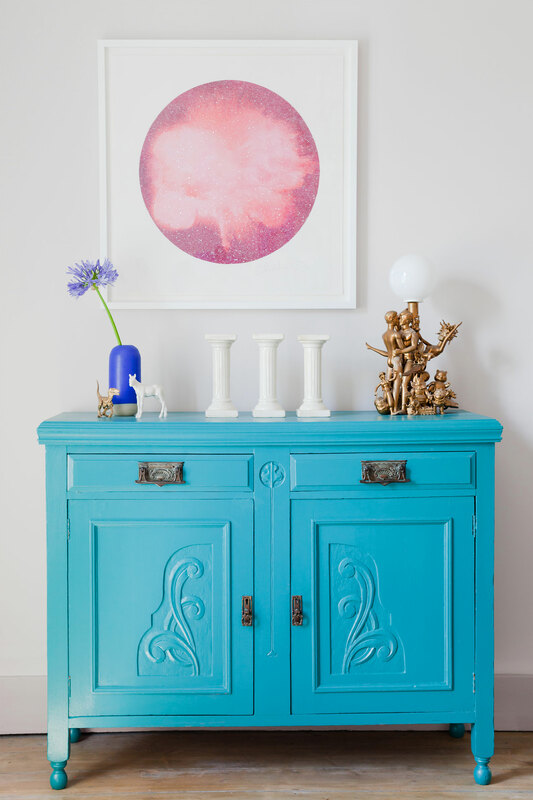 It’s a sideboard that we have had since our first flat together with wooden carved doors. It was in a terrible state when we found it in a little antique shop (we always stop the car and nip in if we drive past vintage furniture shops, just in case). So we painted it neon orange, as you do. 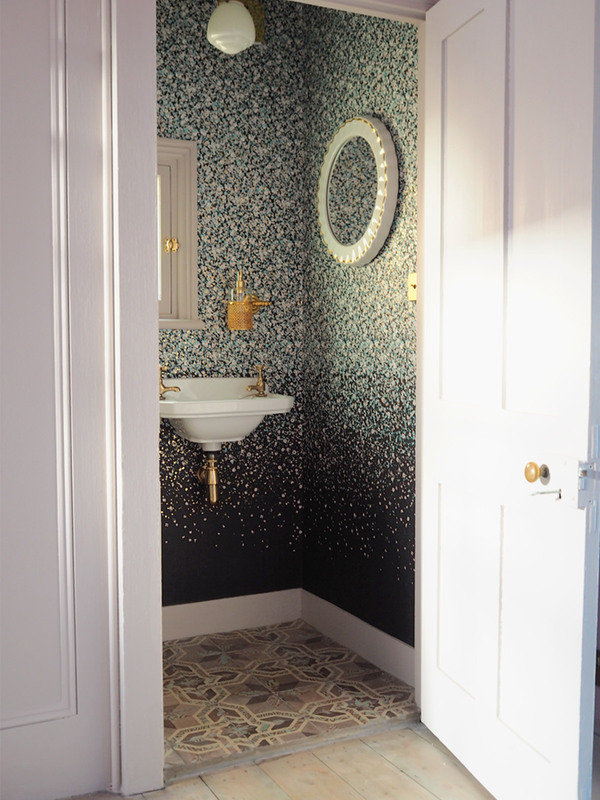 That worked perfectly in our last house, but we have updated it for this house in Farrow and Ball’s Vardo. Now it lives in our bedroom as our linen cupboard. Is that lime wash paint in the blue room? And Bert and May tiles? 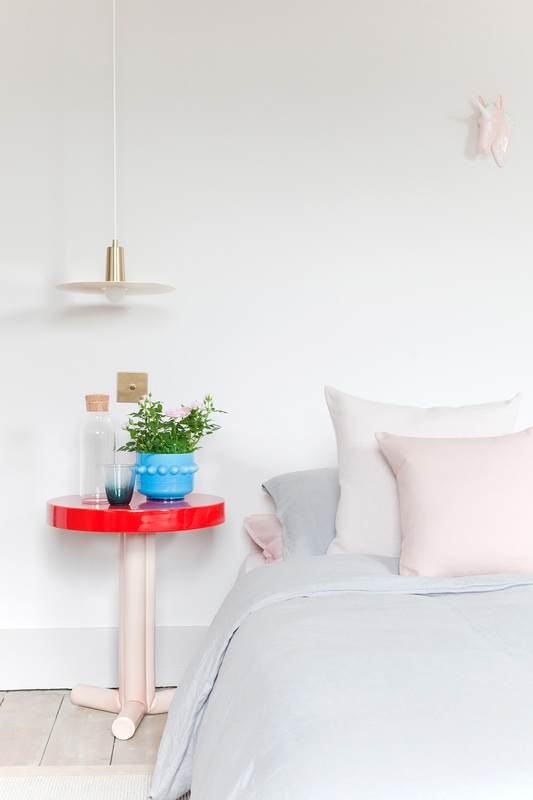 Yes, this is actually a guest room at the back of the house and we designed it for with Bert and May to launch their paint almost 2 years ago! 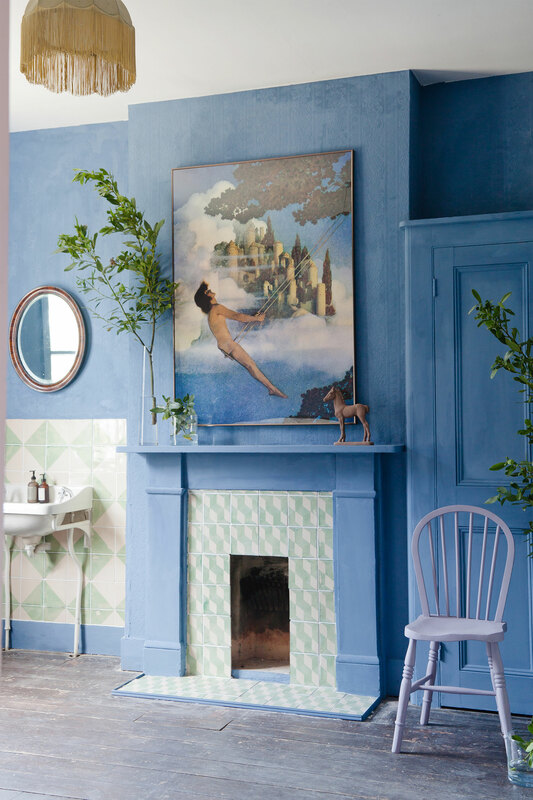 We styled and shot the room for their lime wash paint campaign. It’s a lovely bright room, so can really take the dark colour. 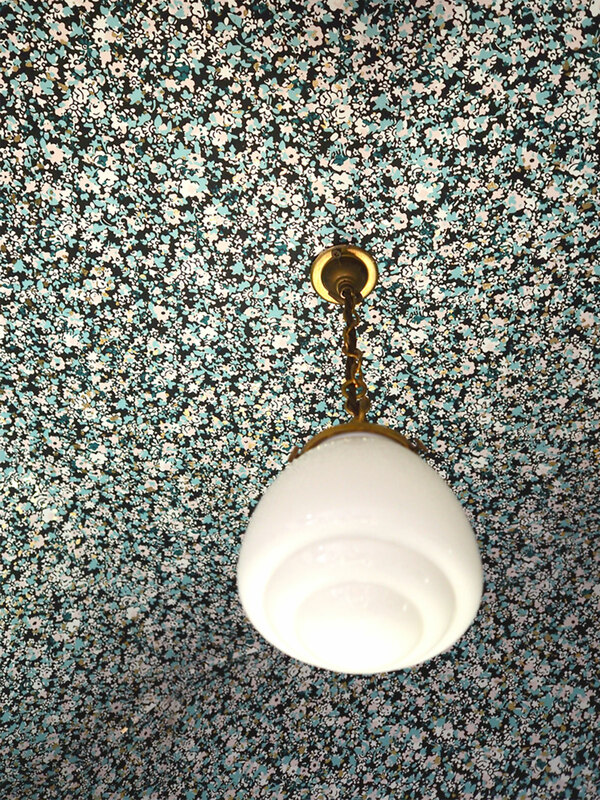 The paint works beautifully on the original embossed wallpaper that was up when we bought the house. It adds another layer of texture. You seem to love some indoor greenery, where do you buy yours? Greenery is good for the soul and good for the air you breathe in your house so we love to go big on plants in our house. We’ve been collecting plants for years. Our fiddle leaf fig was rescued from an office block during a renovation and we found it on Ebay, of all places. It has been going for years and had become very leggy and unhappy so we threw caution to the wind, cut it right back hard, and it has thrived ever since. It’s so big and heavy so we have it on a platform with wheels so he can move around easily without getting damaged or breaking our backs. We also have a money plant (or jade plant) that was originally a cutting from my Mum’s neighbour. It’s now about 20 years old an we have taken numerous cuttings from it to give to friends. It keeps on giving. As does our spider plant that has had about 40 babies. It never stops multiplying. That was from our local garden centre originally. The big palm in the sitting room is from IKEA. It was a bargain and has gone berserk in that room, it just loves it. We water them all once a week. 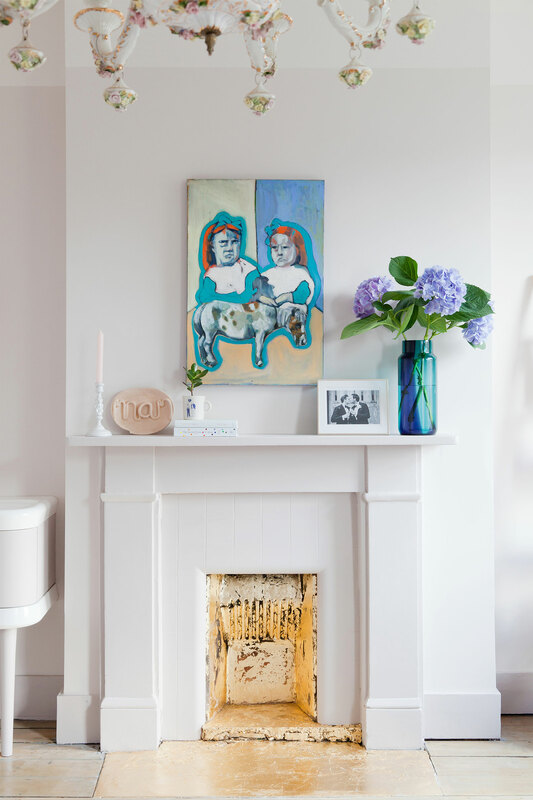 What tips would you give to someone (like me) previously averse to colour in the home? Love that you were ‘previously averse to colour’. That means you are coming round to living with colour and we are so passionate about giving people confidence to use it in their homes because it can make you feel so good. 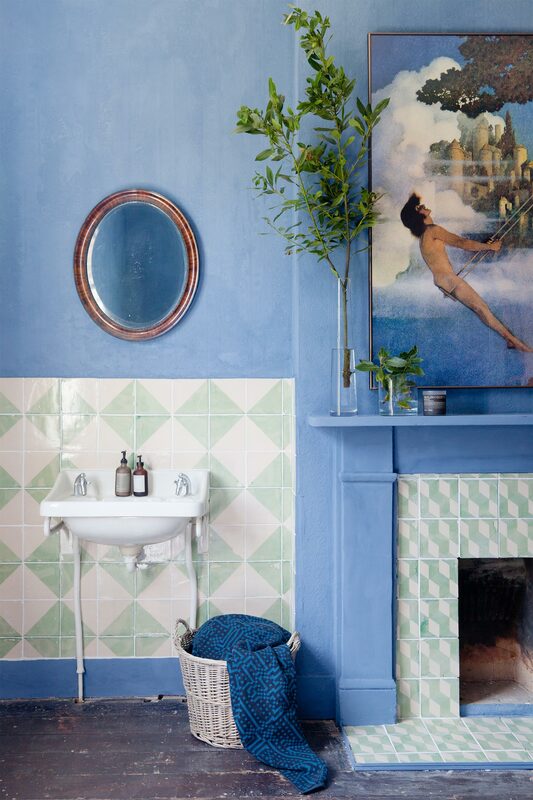 Homes are about atmosphere and colour can be so evocative. Our best advice is to listen to your heart, don’t be afraid, trust your instincts. 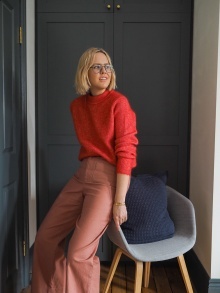 If you are nervous about getting it wrong in your interior but feel confident about colours that suit you in your wardrobe, then that is a great place to start. 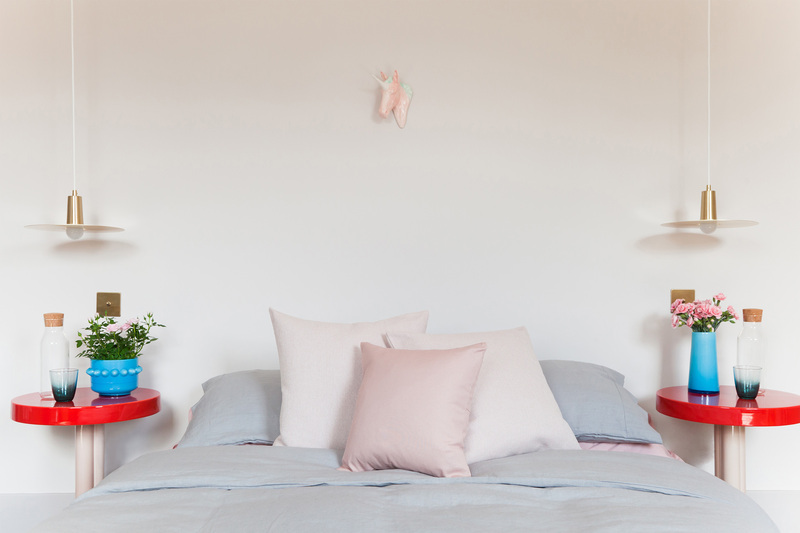 Chances are you will also love living with those colours in your home. Whose idea was the pink bathroom? 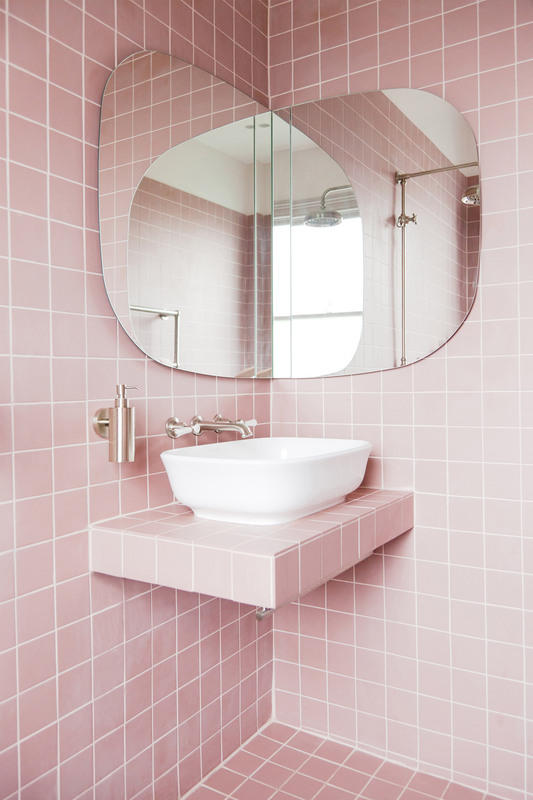 We came up with the pink bathroom design together, about 2 years ago when we first moved into the house. It took us a while to save up the funds to get it installed, but we didn’t want to rush it and it was worth the wait. 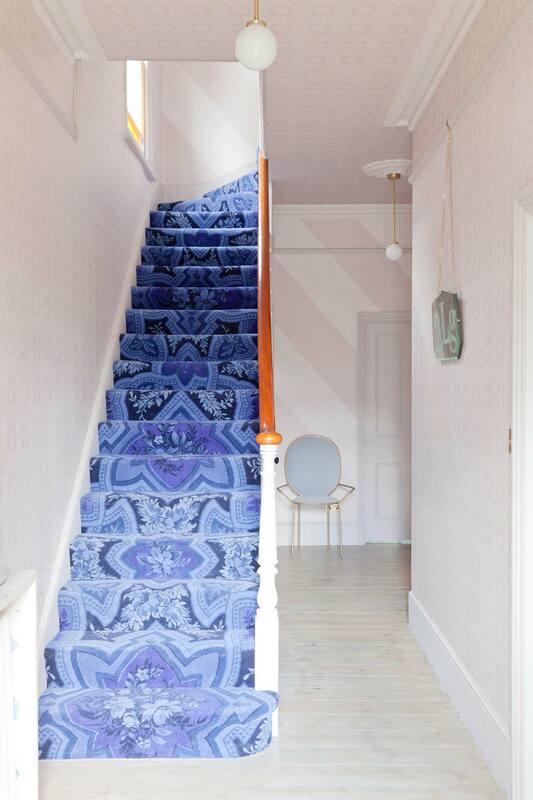 Originally the house had candy pink walls throughout the hallways, part of the reason we fell in love with it in the first place, so we wanted to nod to this in the way we renovated it. 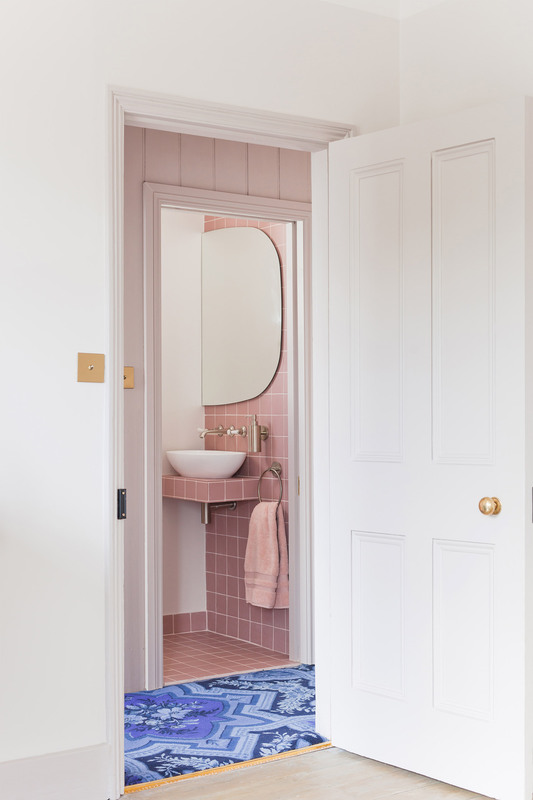 The pink tiles are victorian quarry tiles that you might be used to seeing on pathways to victorian properties. We have used them in a different way, with an all over 80s grid system to give the authentic tiles our own contemporary vibe. 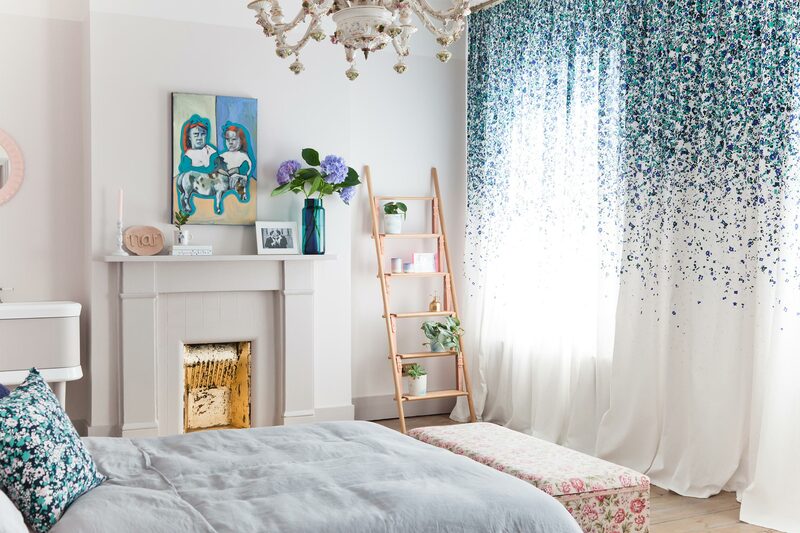 Do either of you have a favourite room in the house? 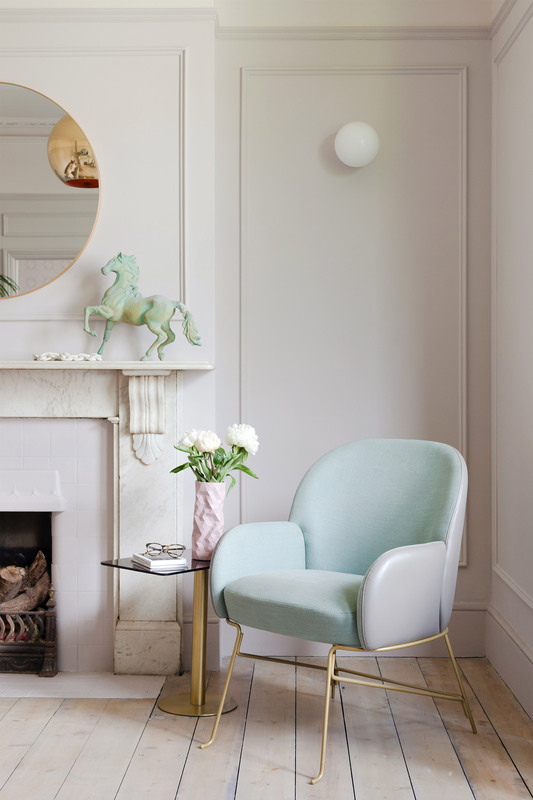 My (Russell) favourite room in the house is the Sitting Room because we use the room to spend time with friends and to relax after work with Netflix and our dog, Buckley, on the sofa. It’s such a calming room and I love the original period details. We are hoping to install a wood burning stove in the fireplace once we can save up for it, then it really will be cosy. Jordan loves the bedroom most of all, especially the curtains. They are wall to wall, floor to ceiling, creating big impact but with a clean line. 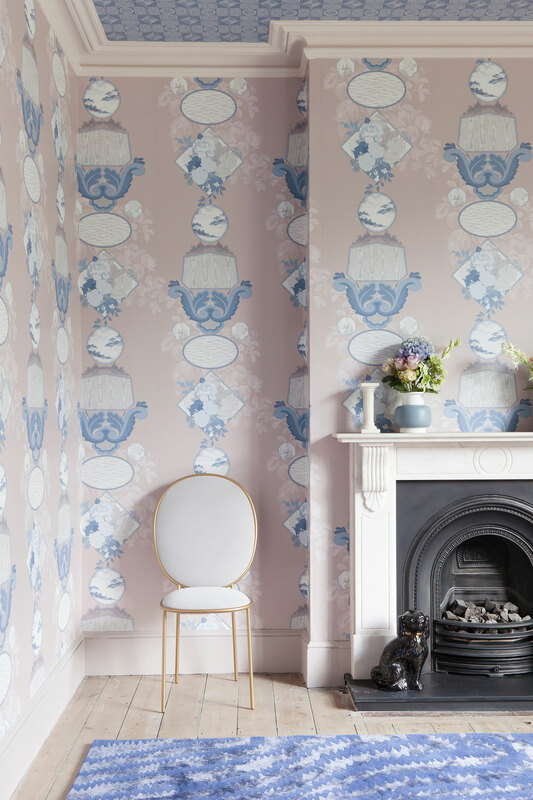 We designed the pattern with Custhom Studio and it is part of our new Forest Hill Collection. It makes us very happy to wake up to. The bedroom is also one of the only places in the house where we have personal items on display (wedding pics etc). It’s our haven. Is that it for decorating or are you itchy to start something new? Gosh no! We still have a big kitchen knock through to do, two guest rooms, our studio, home office and dressing room to complete…let alone the garden! It’s a monster at 28m x 10m but we have big plans. We also spend our working week designing other peoples houses and creating schemes for commercial projects that we are commissioned to design. We are so lucky that we get to do what we love everyday and we get to do it together! 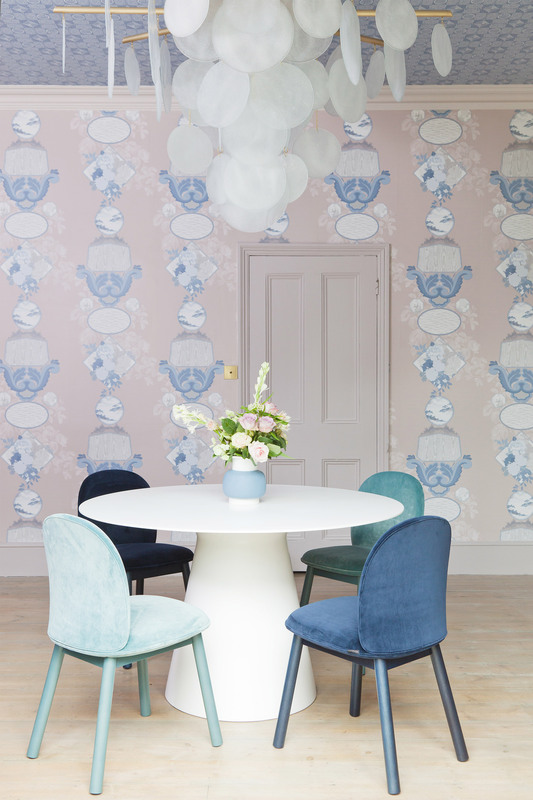 We are currently working on 6 big interior design projects alongside our blogging life. Coming up, we have a celebrity home project that is nearing completion after a 2 year build, a luxury apartment in Waterloo that we have designed and a new collection launching next year. So, just a bit busy then – and I can see why! Thank you Russell and Jordan for letting us into your beautiful home – you can follow their design adventures on Instagram here. Lovely, has a Miami feel about it! Wow a lot of great ideas, I quite like that staircase!! How original ! This is STUNNING!!! One of the nicest spaces j e ever seen!! Stylish and still so livable!! Think it helps I love Pink!! 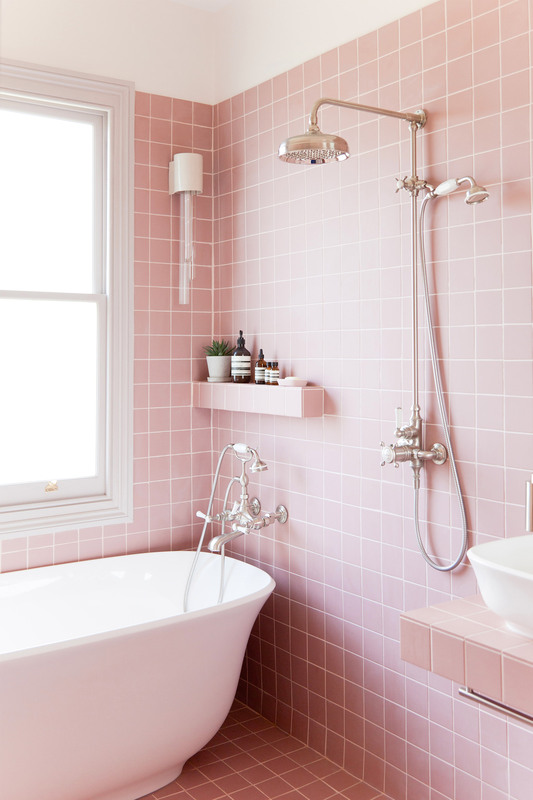 Haha yes – the pink bathroom is everything! I love these interiors features of yours. My gosh, their house is the dream! Do you know if they do tiny projects like helping with modern apartments? Do you know where the light fitting in the little bathroom is from? I’ve been looking for an art deco style piece that isnt too large for absolutely ages! The bathroom’s wallpaper is so great!! I have never seen anything like that! Thank you for sharing!